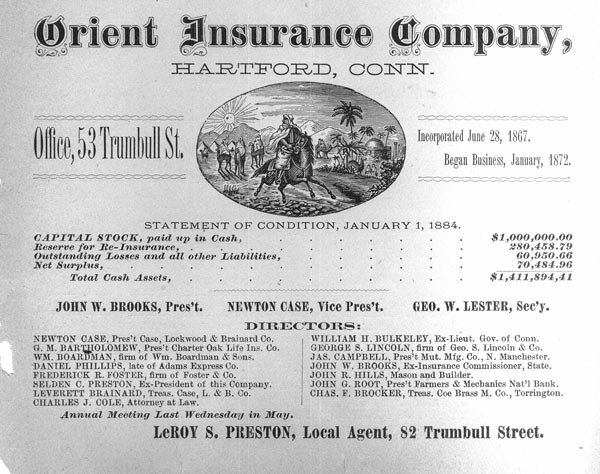 Orient Insurance Company, Hartford, Conn. Office, 53 Trumbull St. Incorporated June 28, 1867. Began Business, January, 1872. John W. Brooks, Pres't. Newton Case, Vice Pres't. Geo. W. Lester, Sec'y. Newton Case, Pres't. Case, Lockwood & Brainard Co.
G. M. Bartholomew, Pres't. Charter Oak Life Ins. Co.
Wm. Boardman, firm of Wm. Boardman & Sons. Daniel Phillips, late of Adams Express Co.
Frederick R. Foster, firm of Foster & Co.
Selden C. Preston, Ex-President of this company. Leverett Brainard, Treas. Case, L. & B. Co.
Charles J. Cole, Attorney at Law. William H. Bulkeley, Ex-Lieut. Gov. of Conn.
George S. Lincoln, firm of Geo. S. Lincoln & Co.
Jas. Campbell, Pres't. Mut. Mfg. Co., N. Manchester. John W. Brooks, Ex-Insurance Commissioner, State. John R. Hills, Mason and Builder. John G. Root, Pres't. Farmers & Mechanics Nat'l Bank. Chas. F. Brocker, Treas. Coe Brass M. Co., Torrington. LeROY S. PRESTON, Local Agent, 82 Trumbull Street.